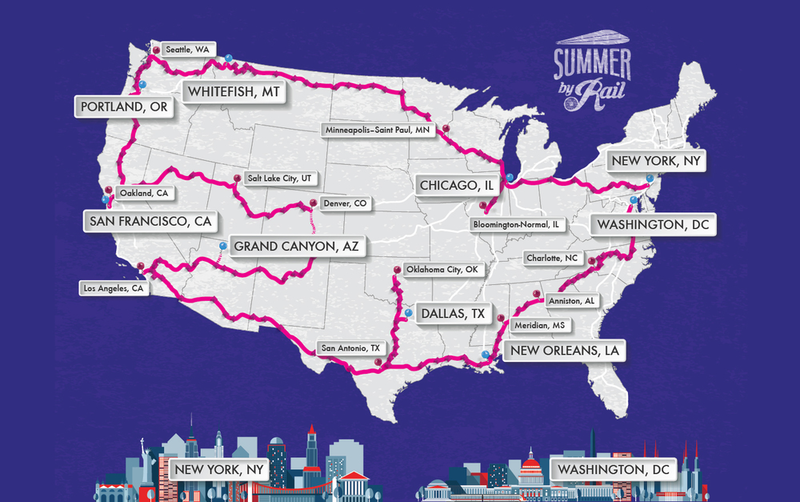 Follow me as I travel across the country by rail. This map is updated every few days to show the new route I've taken. Fun Fact – NYC’s Penn Station is the busiest rail hub in N. America with 500K passengers every day. Did You Know – NYC’s Penn Station occupies 2 full city blocks between 7th and 8th Ave and 31st and 33rd St.
Fun Fact – NYC’s Penn Station opened in 1910 and is considered a masterpiece of Beaux-Arts architecture. Did You Know – Chicago Union Station took 12 years to build, from 1913 until 1925. Fun Fact – Chicago Union Station is the only double-stub station in the US with 24 tracks approaching the station from 2 directions. Did You Know – All Amtrak services in Chicago originate and terminate at Chicago Union Station to avoid transfers. Did You Know – The Oklahoma City Depot was opened to passengers in 1034 and serves 45K people a year. Did You Know – Located in the heart of this "mighty pretty city," the Oklahoma City Depot epitomizes jazzy Art Deco style. Did You Know – When New Orleans Union Passenger Terminal opened in 1954 it was the only air conditioned station in the US. Did You Know – The New Orleans Union Passenger Terminal served 44 passengers and 7 railroads when it was first opened. Did You Know – Meridian Union Station is part of Downtown Historic District, which is on the National Register of Historic Places. Did You Know – Meridian's first Union Station was completed in 1907 in Mission Revival style and at a cost of $250K. Did You Know – The current Charlotte, NC station was built for the Southern Railway in 1962. Did You Know – 100,000 people pass through DC's Union Station daily using Amtrak, Maryland Transit Administration and Virginia Railway Express. Fun Fact – DC's Union Station is larger than the US Capitol and was built in 1908 as part of a "City Beautiful" plan.